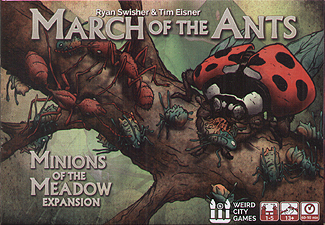 In the Minions of the Meadow expansion for March of the Ants your colonies gain powerful new tools to aid their growth. Major Workers enhance your ability to explore and battle, while aphid farms grant majestic rewards. Parasitic Evolutions thwart your opponents' best laid plans and Tactics create a deeper level of plotting during combat. But beware fearsome new Predators, as they are drawn to the most successful colonies in the meadow!